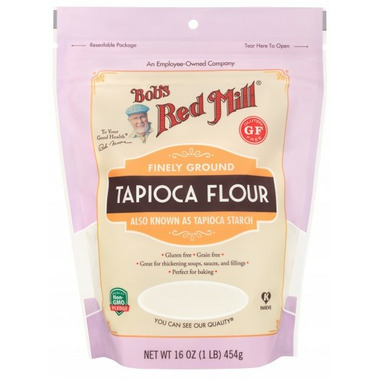 Bob's Red Mill Gluten Free Tapioca flour, also known as tapioca starch, is a starchy white flour that has a slight sweet flavor to it. Tapioca flour is an alternative to traditional wheat flours and has a variety of uses in baking. 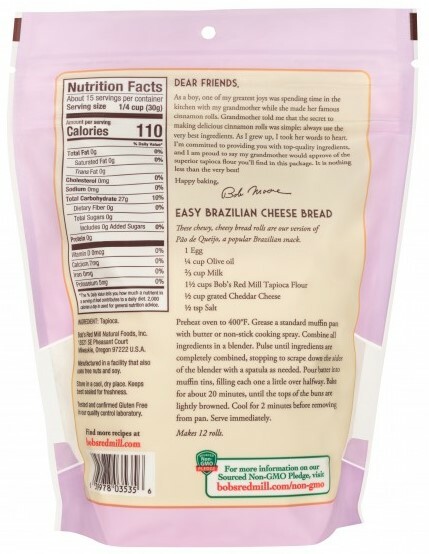 The flour is made from the starch extracted from the South American cassava plant. When the roots have fully developed, they are harvested and processed to remove toxins. The starch is then extracted from the root by a repeated process of washing and pulping the mixture, then separating off the liquid. Great for thickening sauces and adding to baking. I love how the bag zips shut now!